Last year I began a series of Writing Tips for Kids. This is the sixth in the series. Over coming weeks you’ll see more short articles, each of them addressing young writers and dealing with a topic helpful to them. I’ve created a new List for these articles and will add to it over time. The List is embedded below. Here's an example. "What's in the treasure chest?" asked Pirate Pat. "Is that the treasure chest we've been searching for all these years? It's not much of a treasure chest to look at." Can you think of a different way to write that part of the story to avoid the repetition of “treasure chest”? Here's one way: "What's in the treasure chest?" asked Pirate Pat. "Is that what we've been searching for all these years? It's not much to look at." Here’s another example: “The monsters looked mean and had mean grins. They were so mean they gave me the shivers.” How could you re-write those two sentences by removing repeated words and perhaps replacing them with different words? You could look in a thesaurus and find different words for “mean”. You could sketch a quick picture of a monster and brainstorm different words to describe it - like “evil”, “scary”, or “gruesome”. Try to choose words that give your readers a clear er picture of the monsters in their imaginations. NOTE: Two words that don’t fall into this general guideline are “said” and “asked”. Real writers use “said” in dialogue rather than fancier words like chortled or exclaimed because “said” has become almost invisible to a reader. Published writers only use fancier words very occasionally and deliberately. If you suspect you've repeated words in some text, an easy way to check is to paste the text into a Word Cloud like Wordle or ABCya Word Clouds. The word cloud will show you repeated words in bigger font. You could also ask your parent or teacher to help you find a text analysing tool on the internet. You don’t need to worry about little words like “a” “in” and “the” because a reader’s eyes mostly slide over them. The boy jogged to the mountain. The boy climbed the mountain. The boy fell off the mountain. The boy fell onto the rocks. He hurt his arm. He went to the hospital. He got a needle in his arm. He got plaster on his arm. Those sentences aren’t all exactly the same. But they are kind of the same. Writers try to have a variety of sentence types. They might start “The boy jogged to the mountain.” But their next sentence might be longer, and joined up eg “He climbed and climbed until he made it to the top, but wobbled, overbalanced and crashed onto the rocks below.” Can you re-write the paragraph in italics (above) without having such an obviously repeated pattern of sentences? 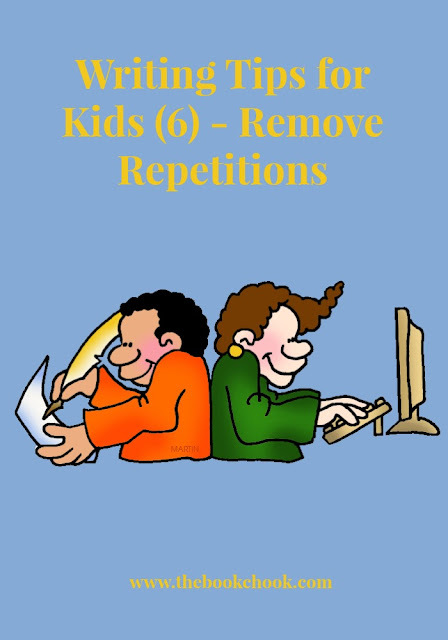 If you’re keen to improve your writing, searching for, finding and removing repetition will really help. 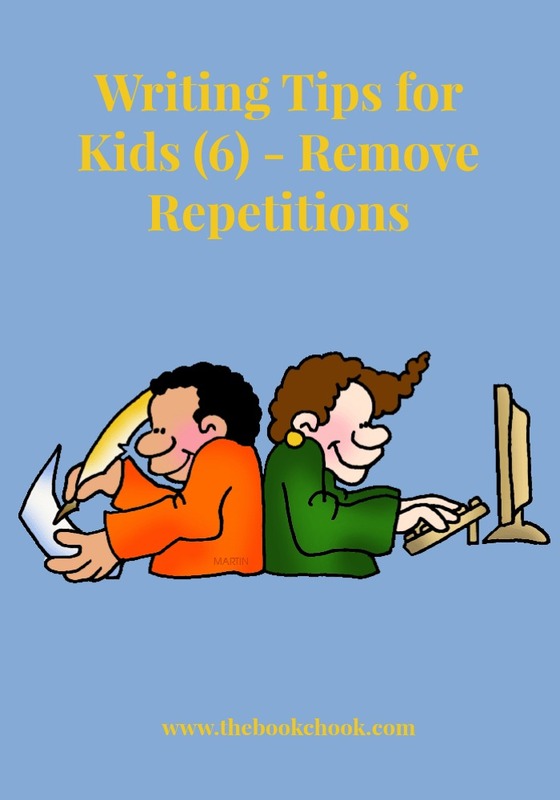 You might also like to read Writing Tips for Kids - How to Start, Writing Tips for Kids 2 - Write What You Know, Writing Tips for Kids 3 - Developing Characters, Writing Tips for Kids 4 - Writing Funny Stories, Writing Tips for Kids - Start with a Hook.